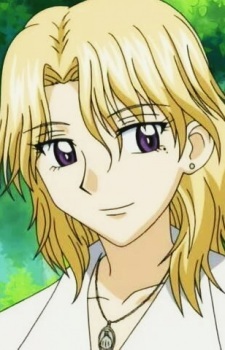 Gender: Male Age: 27 Birthday: August 10 Blood Type: O Nickname: Naru Alice: Human Inclination Pheromone Alice Stone Color: Magenta Horoscope: Leo Narumi is the homeroom teacher of Mikan's class. He teaches Japanese and often deals with Natsume when he gets in trouble or tries to break out. He has the human inclination pheromone Alice, which suits his personality. He is also the moderating teacher of the Somatic types. The author revealed in the character bio that Narumi is indeed a central character, and his past are yet to be discovered. Narumi gave Mikan a star when Sumire became good friends with her and because of her bravery during being trapped in a warehouse (with Sumire and Natsume). Even though he is a bit negligent as a teacher he loves his students and wants to protect them. In both the manga and anime Narumi allows Mikan to call him "Dad" which is ironic because Mikan is the daughter of his unrequited love Yuka Azumi.